Check out the guide for rockets currently launching from Cape Canaveral. 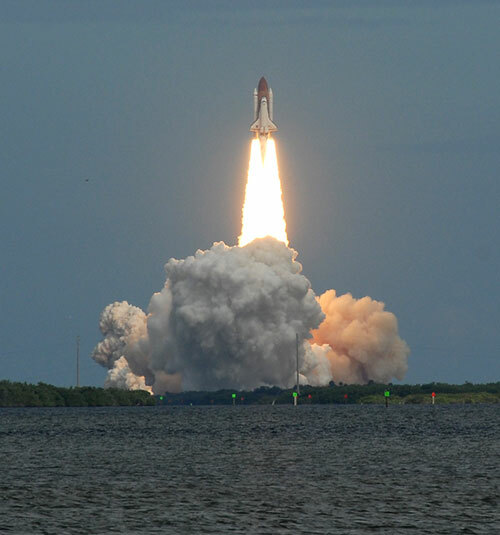 THIS IS IT: The final flight of the space shuttle program, STS-135 Atlantis (click for photos! ), is planned for launch on July 8 at 11:26:46am EDT. The launch window closes five minutes after the launch time. The launch time gets approximately 23-25 minutes earlier each day. A full list of launch times and windows is located here. STS-135 has until approx. July 29 to launch before facing a delay to mid-August. The final mission of the space shuttle program after 30 years and 135 flights, and the last flight of the orbiter Atlantis, STS-135 will carry a crew of just four, for the first time since 1982, and a wealth of supplies and logistics to the International Space Station. 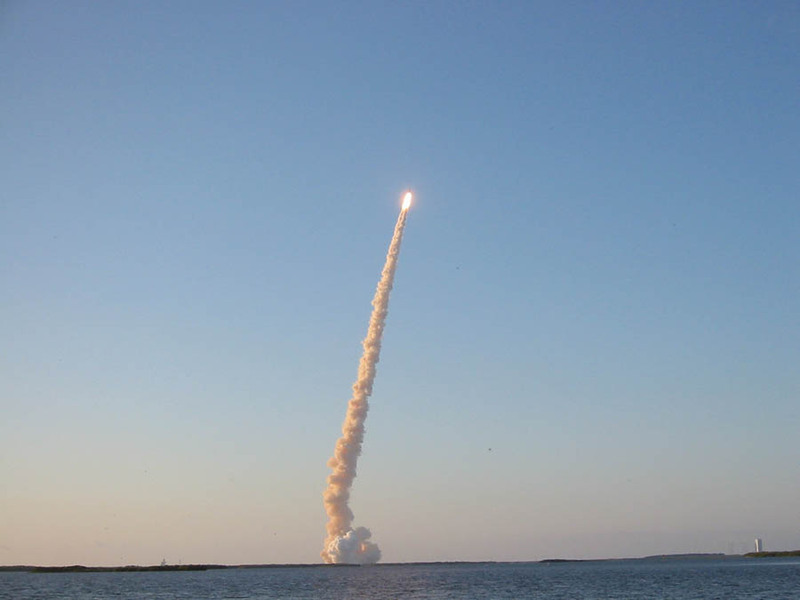 UP TO ONE MILLION PEOPLE may flock to Cape Canaveral to see the final launch, so plan ahead! Information on the launch and the latest information on weather and technical status can be found at www.SpaceflightNow.com. You should check there before leaving for the launch to make sure it is still on time. You can receive up-to-the-minute text message launch updates on your cell phone from them (via Twitter) by texting "follow spaceflightnow" to 40404 (to stop them, text "leave spaceflightnow" or just "off" to stop all Twitter updates; you can turn it on and off at any time). If you would like to order photos you see here, would like more tips on photographing the launch (see next paragraph) or have further questions please ask, but please note that emails received within the final few days before launch may be unable to be answered in time. Please be specific in your emails on photo advice, and tell me what camera equipment you have and where you will be viewing from. I don't have a thorough online guide on shooting launches, because every person, viewing site and launch is different and I am happy to provide in-depth answers to everyone. A standard day launch exposure of ISO 100, f/8 and 1/1000 or ISO 200, f/8 and 1/2000 (or another equivalent) is a good choice for any sunny day. If you are trying to get a telephoto shot, use a tripod, and pre-focus, locking the focus in manually. Never use auto exposure on a telephoto shot of the launch, and never use autofocus on a telephoto shot of the launch. Wide angle photos can use auto exposure. Email me for more specific info or samples of what kind of photo you can achieve from your viewing location with different lenses. If you are at the NASA causeway (or Titusville) and want a closeup, it is best to have at least 400mm on a 1.5-1.6x crop-sensor camera or 500-600mm on a full-frame camera. Don't be thrown by that though; great wide angle shots can be taken to capture the experience better, with the crowds, water, trees and launch making for a great photo. HOW EARLY SHOULD I GET TO TITUSVILLE? Major crowds in excess of 500,000 to 1,000,000 people are expected. At least 6-8 hours out for the last mission; 8-12 hours if you want a good spot and parking. Expect large numbers by 4-6 hours out. Earlier is better even if it is too early and you beat everyone there! There will be many people camping out the day before. I WANT TO VIEW FROM A BOAT WHERE CAN I GO? Not closer than 9-12 miles. See THIS LINK FOR STS-134; times change based on launch time, but restrictions stay the same each day. There are a few tour boat operators that take people onto the water for launch viewing, such as in Titusville which puts you a couple of miles closer than the shore (9-10 miles), but you will need to search around. If the tour is for the Banana River, you cannot go further north than Rt. 528/Port Canaveral (13-14 miles). Any boat tours indicating they will be "closer than anyone" or "five miles" away, etc. are incorrect. HOW CAN I SEE THE SHUTTLE UP CLOSE BEFORE LAUNCH? Aside from if you have causeway tickets, you can't see the orbiter itself except from 13 miles south by Port Canaveral, once the launch tower has been rolled back about 20 hours prior to launch. It is easier at night, but you will need a big lens or scope. You can see the shuttle on the pad from the back anytime between when the shuttle rolls out to the launch pad, over a month ahead of time, until a couple days before launch by taking the "Today & Tomorrow" tour at KSC (just under one mile away). Or, you can drive Beach Road to Playalinda Beach (3.5 miles away) up until four days before launch when this area is closed off. WHAT ABOUT SHUTTLE LANDINGS? See bottom of this page. The only hope for getting those tickets at this point is second-hand, for a premium, or through the bus tours mentioned below. Launches of the Space Shuttle take place off Launch Pad 39A (Google Earth / Maps coordinates: 28.608 N, 80.604 W). 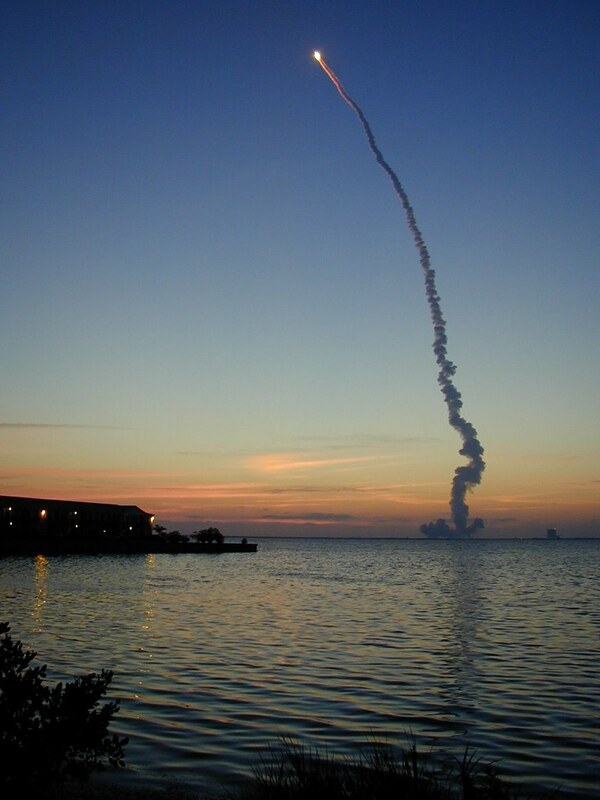 The NASA causeway is the closest and best public viewing site (6.5 miles) for Space Shuttle launches; tickets are required and they sell out fast. Titusville is the second best clear viewing area (12 miles), and is the closest off-site/free location. An option that is between the two in terms of distance, but with no direct view of the launch pad, is the Kennedy Space Center Visitors Complex (7.4 miles). If you cannot obtain tickets to the NASA causeway, then your main thought process going into where to view the launch from should include whether you want a clear view of the launch pad (Titusville) versus being closer and perhaps have the launch be a little louder(KSC Visitors Complex). 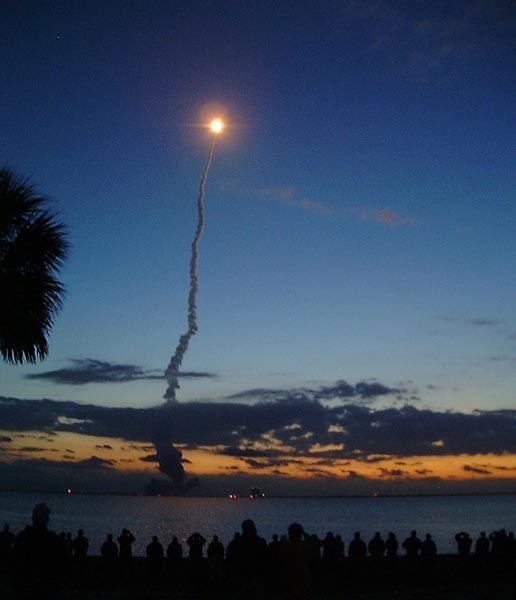 If it were a night launch, Titusville offers the advantage of having a large body of water which will greatly reflects the light given off by the shuttle. I highly recommend looking through the sample photos and videos at the bottom of this page to get the best idea of the differences. Directions to all viewing sites, which are first described below, are located at the bottom of this page. Also provided are links to photos & videos taken by other people from most of the viewing areas described. The NASA causeway is a 2.5 mile long strip of land and roadway, located on KSC property, that runs across the Banana River from NW to SE, due south of Launch Pad 39A. It is the closest spot that the general public can access for a space shuttle launch, and it is also the best. The view from the causeway to Launch Complex 39A is unobstructed with mostly water between you and it. 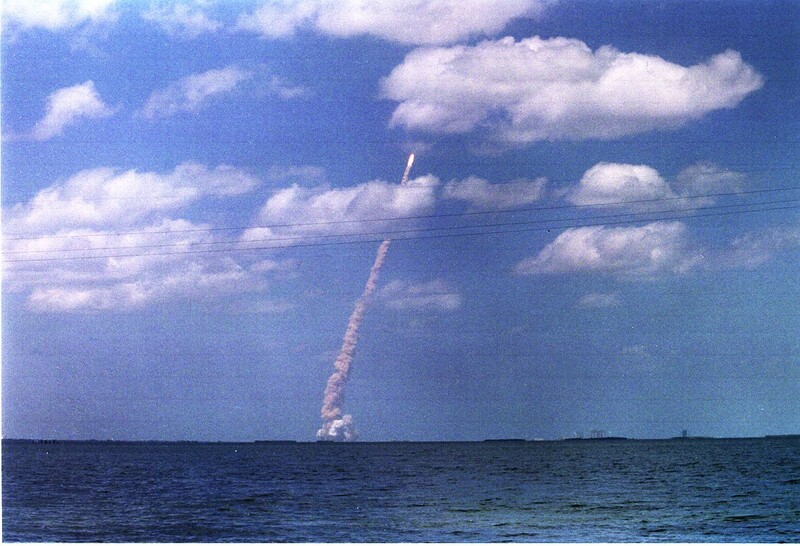 As viewed from the causeway, the shuttle will arc from left to right as it launches. The causeway is angled from northwest to southeast, and since it is due south of the pad, it thus is closer to the pad at the western end by roughly a mile than it is at the eastern end (6.5 versus 7.5 mile distance). Those who have purchased causeway tickets will be on the western end, right around the 6.7 mile mark (just east of the drawbridge, see map). History: Before 2002, NASA gave out (from the Apollo era through early 2002) thousands of free car passes to the causeway. Beginning four hours before every launch, you could drive right to the causeway in your own vehicle - with as many people as you could fit in it - to view the launch. But that was terminated for security reasons in early 2002, save these days for select employees and guests. Since 2002, the KSC Visitors Complex has been in charge of causeway viewing and take by bus, only, a certain amount of visitors (some 2000-5000 per launch) each mission. Passes are sold via the Kennedy Space Center Visitors Complex website for (current price) $61 per person ($51 age 3-11). As of August 2010 and for the remaining shuttle misions, a lottery system is used for all ticket purchases (causeway, visitors complex and hall of fame). You must register for the opportunity to buy tickets approximately two months prior to launch; a random lottery drawing is then held to decide who will purchase tickets. This replaces the previous system, where tickets would go on sale at 9:00am on a particular day and people would all try to purchase through the online system at once. This led to a system crash at STS-132 due to enormous demand. You can sign up on their website to receive an email to let you know when this will take place. Note: When the time comes to purchase your tickets, the NASA causeway tickets are specifically labeled as Launch Transportation Tickets (LTT) and/or Launch Viewing Transportation, so look for those. To purchase the tickets or contact them click here. A causeway ticket package has also been offered to date through two tour bus companies, Dolphin tours ($170 for causeway viewing) or Gator tours (similar; do a Google search for both or look for the link in the official visitors complex lottery email). Gator Tours requires a pickup from an Orlando-area hotel, while Dolphin offers an option for pickup at Port Canaveral. As a last resort, tickets to the causeway (or visitors complex) may also be found on eBay, Stubhub, or space forums such as collectSPACE.com or NASAspaceflight.com at or above face value, some by profiteers and others by those no longer able to make the trip to the launch. Remember that you MUST have a car pass as well, which comes with each ticket set purchased, to enter. EDITOR'S NOTE: The Gray Line/Gator Tour company's Facebook page is another popular place for people selling causeway tickets, for those who cannot make the launch or other reasons. Also note that all tickets, causeway or visitors complex, include two-day admission to the space center with the regular center bus tour included, with the second day to be used within one week of the first (note that the bus tour does not full operate with all stops, if any, on launch day itself). IN THE EVENT OF A LAUNCH SCRUB: If the launch is scrubbed after you have boarded the bus to the causeway, you are going to have to buy a new ticket for the next attempt. The Visitors Complex policy is to put new tickets on sale at the ticket booths right away with with preference for those already there to buy first (but not necessarily those who already had causeway tickets). So, be quick and get on line after a scrub or you may be watching from only the visitors complex the next attempt while others who had VC tickets will be on the causeway. WHAT CAN YOU BRING TO THE CAUSEWAY: if you can carry it, you can bring it, in general. Large folding chairs are not allowed, but those types that fold up and fit into bags are. Big camera lenses and tripods are allowed. Small sun umbrellas are allowed but not beach umbrellas. ARRIVAL TIME: your tickets will be issued with a car pass to park and a stated time to arrive. You must arrive at or before this time; if you are much later, you may not be permitted to enter. The NASA causeway has a public address system which is tuned to the NASA Television countdown broadcast. Live updates on how the countdown is progressing can now be had by texting "follow spaceflightnow" to 40404, courtesy of SpaceflightNow.com. Many people who regularly attend the launches carry scanners as well (sometimes the speakers are hard to hear if it's crowded). If you have your own, tune to 146.9400 to hear the broadcast. Radio stations AM 1240 and 1350 also provide updates. Expect major crowds for the remaining launches. 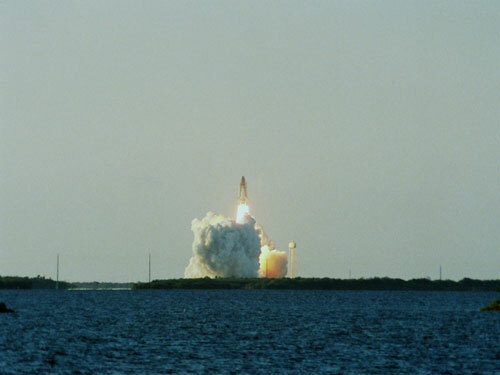 It is estimated that as many as a half-million people attended STS-133 on February 24. Plan to arrive 4-6 or more hours before launch time; remember, earlier is better even if it is too early. This applies to Titusville or any other location below. Titusville, Florida is the closest 'city' to the Kennedy Space Center (right across the Indian River from it) and offers by far the second best and closest off-site viewing after the causeway (not counting the Visitors Complex, which is in fact closer than Titusville; see below). The view from anywhere in Titusville on the river, running the length of US 1 from Garden Street (Rt. 402/406) in the north (where the Max Brewer bridge that enters into Merrit Island National Wildlife Refuge is) down to around US 50 in the south, is perfectly clear across the water to Pad 39A. The distance to the east side of the Route 406/402 Max Brewer bridge (just beyond Parrish Park which lies in the river), and just before where the roadblock lies for launch, is 11.3 miles; to the west ramp of the bridge 11.9 miles; to Spaceview Park (see below) or to the Riverside Inn hotel 12.1 miles; and to the intersection of US 1 with US 50, it is 12.3 miles. A brand new Max Brewer bridge was opened over the river in early 2011, and offers an elevated viewing angle, already very popular with the launch of STS-133 February 24. This is unquestionably the best vantage point in Titusville now. But get there early if you plan to view from the top. One of the other nicer places, and a very popular one, is Spaceview Park at the northern end of Titusville (about a block south of the bridge, on the other side of the apartment buildings at Broad St). The Astronaut Walk of Fame is here too, and provides a nice way to spend the time waiting. A live broadcast of the launch via NASA TV is normally broadcast in Spaceview Park, which is another reason to view from here. Expect big crowds here, though, so arrive early. There are several other parks along the river down US-1 as well, as well as one on the north side of Rt. 406, which is Sand Point Park. Many riverside landowners will charge a fee to park ($10-30 est.) and many visitors like to camp out. Some commercial lots are not open to free parking, so be sure to look for signs indicating you may park there. If you have your own scanner, again, tune to 146.9400 to hear the NASA TV broadcast, or AM 1240 and 1350 for information. As viewed from Titusville, the shuttle will arc from right to left as it heads northeast out of the Kennedy Space Center. The KSC Visitors Complex is actually the closest public viewing area after the causeway, but it has no clear view of the launch pad and you will not actually see the shuttle until it its journey into space has begun. This spot does have the advantage of being closer than Titusville, so the sound should be a little greater. The distance from the Visitors Complex is 7.4 miles to Pad 39A. Tickets can be purchased (using the online lottery system described above, only) for $43 per person ($33 ages 3-11) to view from the VC here. You are allowed to spend your time wandering the Visitors Complex grounds and viewing the exhibits, but cannot board the buses to go to the causeway. Your admission also includes the regular bus tour, and the ability to come back for a second day within a week (note that the bus tour does not run in full or at all on launch day). So, if just being closer is more important than the overall view and seeing the shuttle lift off the launch pad, this is second best choice after the causeway. It may also be a good choice if you have small kids who need to be entertained, as you have the freedom to wander around the VC looking at the exhibits and rocket garden during the wait. If you're a photographer, though, you should probably stick to Titusville. Finally, keep in mind the Visitors Complex can be crowded; it can accommodate as many as 10,000 people. Many people either believe, or are told by locals, that Jetty Park is a great place to view shuttle, and all, launches. This is not true. Please read on. The view from Port Canaveral (the large cruise and cargo ship port with terminals), and the Beachline Expressway (Rt. 528) that runs through it, is clear and unobstructed looking up the Banana River from the south. But it is far (13.2 miles to 39A from the Port, 14.2 miles to where Rt. 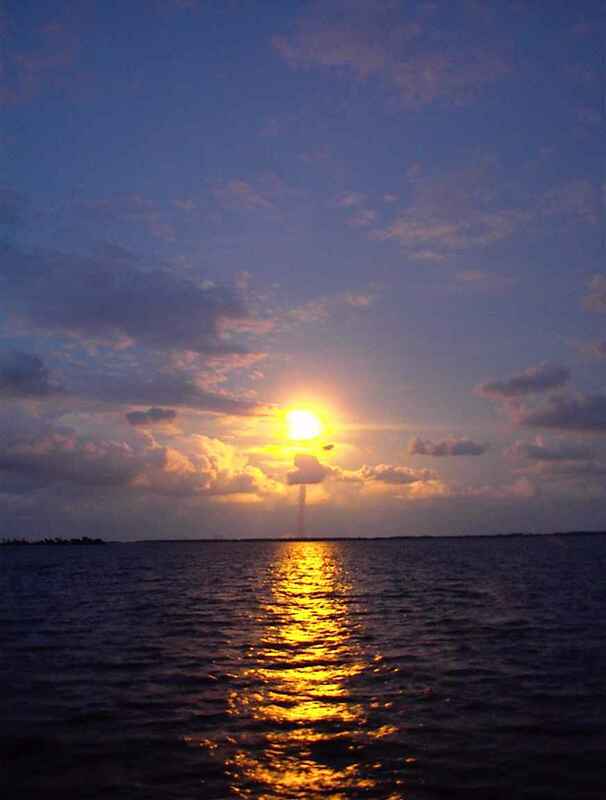 528 crosses the Banana River), such that the sound will have dissipated significantly by the time it reaches you well over a minute into flight. There is no reason to go here if you don't have to, when Titusville is just a few minutes drive away. Jetty Park is a well known spot adjacent to Port Canaveral on the Atlantic Ocean at the very southern border of Cape Canaveral Air Force Station. It has a 1200-foot pier that was built to accommodate launch viewing. But it is not an ideal spot for viewing Space Shuttle launches (only Delta 2 launches). 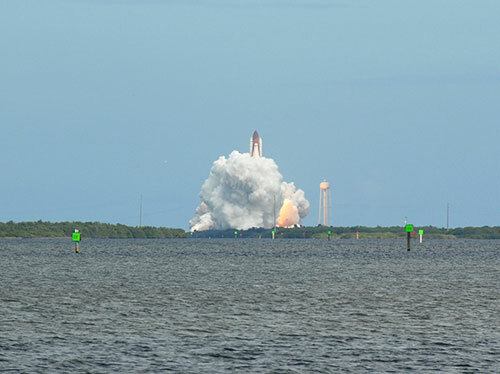 The view from Jetty Park (13.8 miles from Jetty Park to Pad 39A), as well as anywhere south on Cocoa Beach, including the Cocoa Beach pier, all at 15-20 miles distant, is obstructed by a hill, trees or buildings until the shuttle has launched and climbed into the sky. But they are ideal and scenic locations if you like the idea of watching it head up and out over the Atlantic while you swim in the Atlantic ocean at the same time. Again, be aware that you cannot see the launch pad from these areas, that you will not see the shuttle until after it has lifted off and climbed into the sky, and that you are unlikely to hear any more than a distant rumble by the time the sound reaches you. Please realize that Cape Canaveral Air Force Station and Kennedy Space Center comprise an area that is over 30 miles long and 10 miles wide. There are 15 miles between the southernmost launch pads and the northernmost (which are the Shuttle pads). Port Canaveral and Jetty Park are located on the southern border of Cape Canaveral AFS. Click here for directions to Port Canaveral, as the spot to view from is the same as for Delta 4 and Atlas 5 viewing. Get there early as spots do still fill up fast and traffic can get heavy. Click here for directions to Jetty Park specifically. For Jetty Park, get there very early. For just viewing from the beach you can take it more leisurely as there is much more room to spread out. The KSC Visitors Complex also sells tickets to view from the Astronaut Hall of Fame (AHOF). The AHOF is located in Titusville at 12.2 miles from Pad 39A. You cannot see the launch pad well from here, as it is just barely blocked by the Vehicle Assembly Building on the horizon in the same direction. There is no reason to pay for this when you can watch for free with a crystal clear view from the same distance elsewhere in Titusville. Note: for NASA causeway viewing, directions are the same as for visitors complex viewing. Causeway busing is conducted from the VC. From Daytona: For Titusville viewing, Take I-95 South for about 40 miles (further if you are north of Daytona) to Exit 220 and go left. The road (Rt. 406, Garden St.) runs right into the river at the Max Brewer bridge (which continues into the Merrit Island NWR, closed during launch time) and a great place to view is right there along the bridge, or in Space View park and the Space Walk of Fame which is one block south of this bridge. If it's filled up with cars, drive south on US 1 instead, looking for clear spots along the river. For the KSC VC, stay on I-95 to Exit 215 and go left. Then, you will turn right at the second light and follow the signs to the Kennedy Space Center and Astronaut Hall of Fame. The Visitors Complex is located about ten miles down the road, right before the security entrance to KSC, and cannot be missed. From Orlando: For Titusville, take the Beachline (Rt. 528) east until the highway forks. Take the left fork (the signs direct you to Titusville and Kennedy Space Center). You are now on Rt. 407, the Challenger Memorial Parkway. When the road ends (in a T intersection) after several miles, turn right. You are now on Rt. 405, also called Columbia Blvd. Then, exit onto US 1 North and drive until you reach the point where the river runs close to the road. Anywhere along the river for the next five miles (mainly north of US 50) offers prime viewing, so look for a good spot to park. For the VC, don't get off on US 1. Stay on Rt. 405 and go past the Astronaut Hall of Fame about six more miles. The VC is on the right and cannot be missed. From South on I-95: For Titusville, take I-95 north to Exit 215 and go right (east). Stay on this road (US 50) until it hits the river. Turn left, and look for a good spot along the river anywhere for the next five miles. For the Visitors Complex, turn right off the Exit 215 ramp from I-95 and then right at the first light (follow the signs to the Kennedy Space Center and Astronaut Hall of Fame). The Visitors Complex is located about ten miles down the road, right before the security entrance to KSC, and cannot be missed. Directions to view from locations south of Kennedy Space Center, such as Port Canaveral, Rt. 528, Jetty Park and Cocoa Beach are available by clicking this link to go to either the Delta 4 & Atlas 5 viewing directions, or the Delta 2 viewing directions (for Jetty Park specifically). The following are photos, taken by other people, of shuttle launches as seen from each of the areas mentioned above. Because camera lenses can distort the photo and make it seem like things are smaller and farther away than they really appear in person, I have made a note next to those that are actual views vs., for example, those that are wide angle. So, in a wide angle photo, the shuttle and smoke trail appear appear significantly bigger/closer in person. The following are YouTube videos that best represent the views from the three main viewing sites. All are of the "actual" view variety as best as I can find; those at night show approximately how bright the scene is, though no video camera can properly capture the sight. Most videos do not capture the sound properly. Finally, all videos from the NASA causeway below are for launches that took place off of Pad 39A, the closer pad to the causeway and which all future shuttle launches will take place from. Note: Some video titles or descriptions contain incorrect information about distances and other facts. WHAT ABOUT SHUTTLE LANDINGS AT KSC? Unfortunately, there is no place that the public can photograph the shuttle's wheels hitting the ground as you see in so many great photos. It is possible, however, to watch the shuttle glide in to final approach from various angles, but in all cases you will see it in the air from a distance and then lose it behind the trees as it approaches touchdown. (Night landings cannot be seen, period; only the twin sonic booms would be heard). The Kennedy Space Center's Shuttle Landing Facility has a north and south approach, runways 15 and 33, respectively. A runway decision can be made with just 90 or even 15 minutes to spare, though more often than not the wind direction (more so; aircraft land into the wind if they can) or sun angle (less so, but more likely in calm or crosswind conditions) makes the decision easier to predict. Landings on either runway can be viewed from Titusville; it's like watching a commercial plane land from between 5.5 and 7.5 miles away. (See a video). Head to the northern part of Titusville or on the new Route 406 bridge for Runway 15 landings (best) or southern areas along US 1 for Runway 33 landings (not as good). And if you are looking into the sun or it's cloudy or hazy, it may be hard to spot the orbiter. If it's Runway 15, a better choice for viewing in general, then it is possible to see the shuttle come in from the road leading through Merrit Island NWR and to Playalinda Beach from within a mile or so (study a map). With the right equipment, it is possible to capture a decent photo from this location. (See a video). If the shuttle is headed to Runway 33 from the south, and it's daytime (operating hours), the KSC Visitors Complex lies just to the west of the final approach and is the only location to try and see it from a closer vantage. 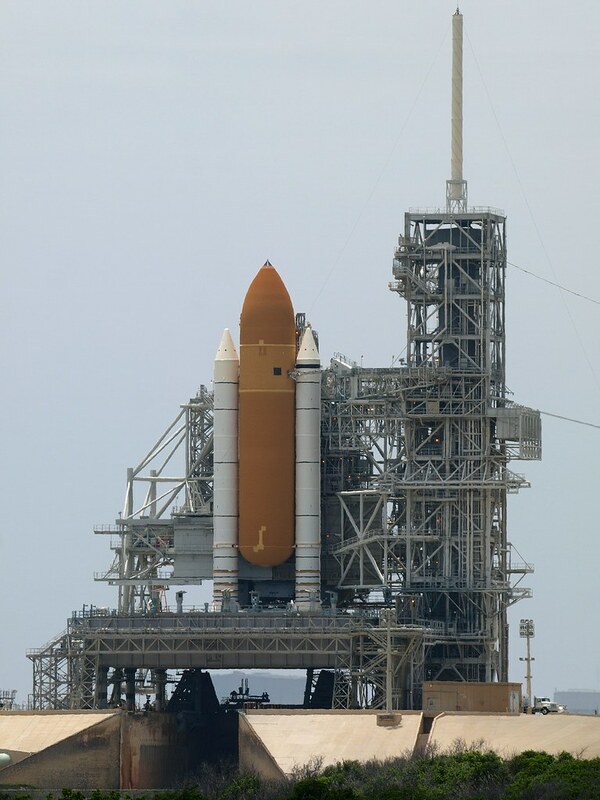 It may also be possible to view from the shuttle launch pad viewing gantry, the first stop on the main bus tour. You can watch the landings on either end, though the south approachis much closer (4.0 miles) than the north (6.0 miles). Again, this is only during operating hours. So, if you have come to KSC for the landing despite the viewing distance, it is daytime, you have good eyes, and it is clear skies on top of that, look for the shuttle as a white spec about 60,000 feet up starting about five minutes prior to landing as it crosses relatively overhead and then circles out over the ocean on the heading alignment circle to align with the runway. And whatever runway they chose, cloudy or clear (and for night landings), you will hear the shuttle's signature twin sonic booms about four minutes prior to landing (you can also hear the booms anywhere within up to 30 miles of the shuttle's landing track, elsewhere in Florida, from the point it crosses the Florida border earlier in the approach).